Miniature poodles are defined as those that are between ten and fifteen inches tall at the highest point of the shoulder–about two-thirds the size of a standard poodle. 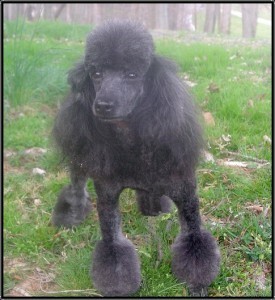 The name is a bit misleading, since they are not the smallest of the breed (toy poodles are less than ten inches tall). Miniature poodles are recognized as a specific breed by both the AKC and the UKC, and are the most popular among the three breeds. Miniature poodles come in all colors; black, white, cream, chocolate, apricot and even red. There are also miniature phantom poodles, which are pups that have markings like those of a Doberman. They are usually quite happy living in apartments, and like all poodles, they don’t shed. Miniature poodles are very active and intelligent. Their only drawback is that they might be neurotic or overly sensitive if they are not adequately socialized. This is not a problem with puppies from Homestead Poodles. Because we raise our puppies entirely in our home, they are completely socialized and used to being around strange people, other dogs, and even cats by the time they come to you. We don’t specialize in miniature poodles at Homestead, but they are occasionally born to somewhat smaller dogs. All our puppies come with a health guarantee, a five-generation pedigree and double registration with the AKC and the UKC. Not only do we want to be sure that you and your puppy are perfect for each other, we also take great strides to make sure your puppy is perfect, overall.